The Church of the Holy Sepulchre is situated on the hill of Golgotha, meaning "place of the skull". The Church itself is shared amongst five Churches, each having their own section, the five being the Syrian Orthodox Church (originally known as the Church of Antioch), The Coptic Orthodox Church (originally known as the Church of Alexandria), the Roman Catholic Church (originally known as the Church of Rome), The Armenian Orthodox Church and the Greek Orthodox Church. What is of note, is that these Churches represent all those personally founded by the apostles and all have maintained altars as part of their spiritual service to the Lord Jesus Christ since their earliest beginnings. 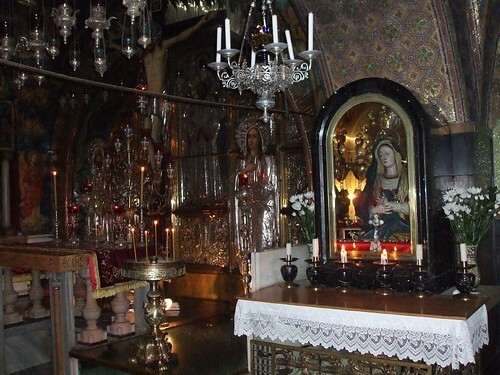 The Altar shown in this photo is served by the Syrian Orthodox Church, keeping its earliest traditions as they received them from their founder and first bishop, St Peter, the Apostle. From the earliest biblical accounts, we read mentions of Altars being erected in the service of God, setting a precedent for the place where a Blood sacrifice would be made. After Abram became Abraham, he still acknowledged the need for an Altar. In addition, Solomon, the wisest of all men built altars. The Psalms tell us to praise the Lord before the Altar. The use of Altars, in imitation of the true Altar in Heaven did not finish with the Old Testament. Jesus Himself gave instructions, referring to Altars as He prepared the way for the Christian faith. The Apostle Paul acknowledges the continuance of Altars when he said that although they had the right to live off the altar, they were also to live off the Gospel of Christ. The Book of Revelations also testifies of the Altar in heaven, of which the Altars on earth represent. Ignatius, a bishop and a student of the apostle John testifies of an altar being part of the Christian faith, confirming their continued use within the early Church. The local council of Albon (Epiona) in France, 517 AD forbade hallowing Altars, other than those made of stone. Bishop Wulstan of Worcester (1062- 1095 AD) ordered the destruction of all the old timber altars in England. After Christianity became the official religion of Rome, Emperor Constantine presented to the church of St. Peter an Altar made of silver, inlaid with gold, decorated with green and white jewels and jacinths on all sides. The number of jewels reached 400 and weighed 35 pounds. My first question is this, regardless of what Rome may or may not have done, or are still doing today, by what authority can any mortal man change what God has implemented and declare it not part of a “True Mass”? Secondly, what should Christians today follow, the words of a fallen Roman Monk, regardless of his intent as that is for Christ to judge, or the scriptures that are supported by history that both show beyond any reasonable doubt that an Altar has always had a place in the worship of God in both the Old and New Testaments? Unfortunately, today many of the Protestant world have developed a great respect for the Roman Monk in question primarily because of his stand against the corruption of his church, being the Roman Catholics. However, it seems thatvery few have actually studied his teachings and compared them against either the Word of God or the faith and practices of the original Church. Thus Martin Luther's own false teachings are generally overlooked completely, him being the monk in question. May I conclude with a final thought, in the book of Isaiah we read prophesies concerning the Lord's Day of Judgment where it is written that in the land of Egypt there shall be an altar to the Lord after God smites them and they turn to Him. It then refers to a highway between Egypt and Assyria and they shall serve the Lord together. But in verse 24, the prophesy then adds Israel as the third with them and calls Egypt God's people, Assyria the work of God's hands and Israel His inheritance but where are everyone else. I think we should consider this when we meditate on the fact that they have an altar and the vast majority today don't.